Naughty me - I've been neglectful of this blog this week. Sorry! But to make it up to you... here is the June cover. 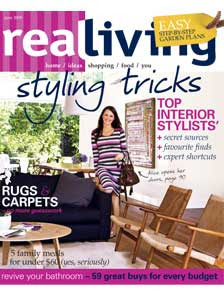 It's out Monday and it features Real Living's lovely stylist Alice on the cover in her gorgeous home. NO MODELS! So refreshing... Al and I used to work together until we both got pregnant at the same time, along with another stylist, and all three of us left our poor editor Deb within a few weeks of each other. She now freelances for us and is responsible for most of the pretty images you see in our mag. I thought my life was busy... Until I interviewed her for the feature: she managed to have a baby, get married, and knock down her house for a complete rebuild all within the space of a few months. Now her house is complete and we thought we'd give you a look at how experts renovate and decorate (she's a stylist, hubby is a builder - perfect match!). And back to poor Deb - she's on about hiring all men: both myself and our deputy, Natalie, are due to leave her again in a few weeks to pop out babies. Seeing as Nat took over my old job, my chair has been confiscated from the office - just in case! So what else is in the issue? We show you gorgeous decorating ideas with letters, get warm and snuggly with faux fur, guide you through buying rugs and carpets and give you a house tour of Amy Butler's house. It's my fave issue yet, I think. I might say that every month, but they just keep better in my opinion! Love to hear your thoughts on it next week once you've read. And don't forget the website will change from Monday too with projects, ideas and answers to your decorating dilemmas. And I haven't forgotten: Danielle and Anastacia - you both scored free issues for your help with the store-window project. Just email your address to bgraham@acpmagazines.com.au. On that topic - the lady beat us all to the post and had decorated before I got the chance to send her some ideas (erm possibly my fault for taking so long. Oops). But, she loved all our suggestions and is looking forward to redecorating in the near future, so stay tuned! Have a good weekend. Hope to get some projects finished this weekend to share with you next week. You can subscribe to Real Living from www.magshop.com.au - it says they do international orders! its a great issue as always!! I'm still here.... and in one piece!